Hilltops LB Cody Peters, right, was named the CJFL’s top defensive player. The 2018 football season keeps getting sweeter for Saskatoon Hilltops linebacker Cody Peters. On Friday night at the Canadian Junior Football League’s awards banquet at the Radisson Hotel, Peters was named the winner of the league’s Larry Wruck Defensive Player of the Year award. Peters became the first Hilltops player to claim that honour since Cole Benkic back in 2015. 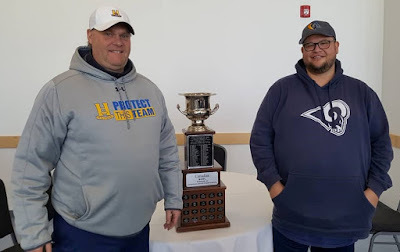 As an added bonus, Peters accepted the award from Saskatoon Hilltops linebacker great Larry Wruck, who the defensive player of the year award is named after. In late May and early June, Peters, who is in his fifth and final season with the Hilltops, attended training camp with the CFL’s Saskatchewan Roughriders along with Hilltops star defensive back Colton Holmes. Peters proceeded to spend the first two weeks of the CFL season on the Roughriders practice roster. When he returned to the Hilltops, Peters recorded 26 total tackles, 3.5 sacks, two forced fumbles and one interception during the regular season helping the Hilltops post a perfect 8-0 record. In the Hilltops two post-season wins, Peters had nine total tackles and a forced fumble. The Hilltops (10-0) will try to win an unprecedented fifth straight CJFL title on Saturday and try to complete a perfect season hosting the Langley Rams (10-3) in the Canadian Bowl at 1 p.m. at Saskatoon Minor Football Field. During the campaign, Peters picked up honours as a Prairie Football Conference all-star, most outstanding linebacker and most outstanding defensive player. On Wednesday, he was name a CJFL all-Canadian all-star. The Peter Dalla Riva Offensive Player of the Year was awarded to quarterback Jake Marquette of the Hamilton Hurricanes. Marquette, who was a CJFL all-Canadian all-star, completed 97-of-145 passes for 1,760 yards, 28 touchdowns and one interception in eight regular season games. Marquette quarterbacked the Hurricanes to an 8-0 regular season record and a berth in the CJFL semifinal game, where they fell 39-14 to the Rams in Langley on Nov. 3. Hurricanes receiver Keyshaun Jordan took home CJFL Rookie of the Year honours. He topped the Ontario Football Conference with 33 receptions, 753 receiving yards and 15 receiving touchdowns appearing in all eight regular season games. HCs Tom Sargeant and Howie Zaron pictured with the Canadian Bowl. Hurricanes president and general manager Mike Samuel was named the winner of the Stewart MacDonald Executive of the Year award. The Gord Currie Coach of the Year award was presented to Chilliwack, B.C., based Valley Huskers head coach Bob Reist. Reist guided the Huskers to a 6-4 record and their first playoff berth in the British Columbia Football Conference since 2008. Huskers defensive lineman James Moar claimed the CJFL’s Past Commissioners Community Service award. Before the awards banquet was held, the CJFL held a press conference on Friday afternoon where the head coaches from both the Hilltops and the Rams addressed the media at SMF Field. The Hilltops head into the Canadian Bowl coming off a 19-day layoff from last hitting the field for a game, when they downed the Edmonton Huskies in the PFC final on Oct. 28. Legendary Hilltops head coach Tom Sargeant was in top form, when asked about the opportunity his team had to win a fifth straight CJFL title. “We’re here for the fifth-year players,” said Sargeant. “Last year was last year’s team. The year before was that team. “This is this team, so they just want one. They don’t care about all that other stuff. That is noise. Rams head coach and general manager Howie Zaron said his club is just worried about trying to beat the Hilltops squad that will take the field on Saturday. “I think, if you get caught up in the championships and the four in a row and all that stuff, you’re already defeated before you get here,” said Zaron. “It hasn’t been a thought for us at all. “We’re just here to have some fun and win a football game. Everybody likes to make a big deal of these games. It is just another football game for us. This will mark the third time in seven years the Hilltops and Rams face each other in the Canadian Bowl. The previous two encounters were both held in McLeod Stadium in Langley, B.C.